Exit devices, commonly referred to as panic devices or crash bars, are door locks that allow single action egress on doors that exit the building. A well-maintained exit device provides both physical security to prevent unwanted entry but also allows simple exit, especially in an emergency situation. Exit devices can be single-point security or multi-point security depending on the end user’s needs. Multi-point exit devices can have the latch and one or two vertical rods. The vertical rods secure into the header and threshold of the door frame to provide excellent security. The vertical rods can either be concealed in the door for better aesthetics or left exposed to save money. 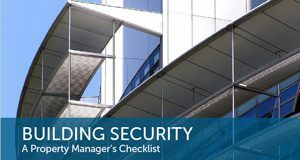 Aside from mechanical panic devices, there are electrified devices when access control is needed which will provide yet another level of security for your building. Selecting the right exit device for your application can be a daunting task. Often a building engineer or architect can spec an exit device that sounds appealing but realistically is an impossibility to install. 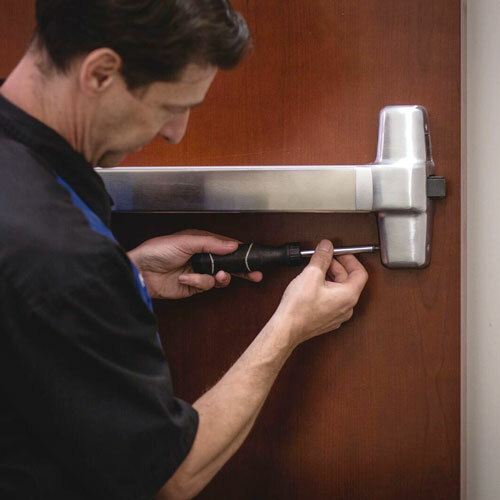 We recommend communicating with a locksmith prior to ordering hardware to help determine which exit device is correct for the application while also determining if the effectiveness of its security. We supply, install and repair all types of exit devices. Contact us to discuss your requirements. What happens if you already have your panic device installed but it isn’t performing as factory specified? Fear not? Contact Bomac’s and we will provide a quote for repair or schedule a free survey to determine where the failure is and implement a repair.